If the parking lot across from Admin Annex is full, staff are encouraged to utilize K Extension Lot as pictured below. 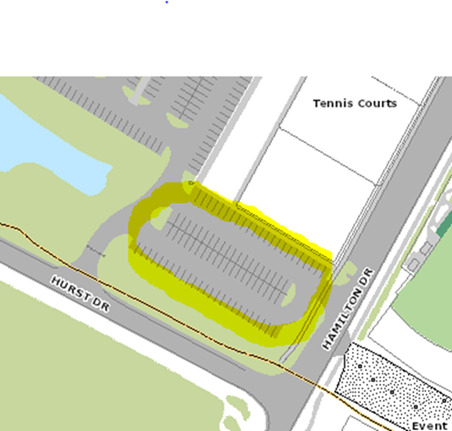 Lot K Extension (outlined in yellow above) is available to Admin Annex Staff as alternate overflow parking. 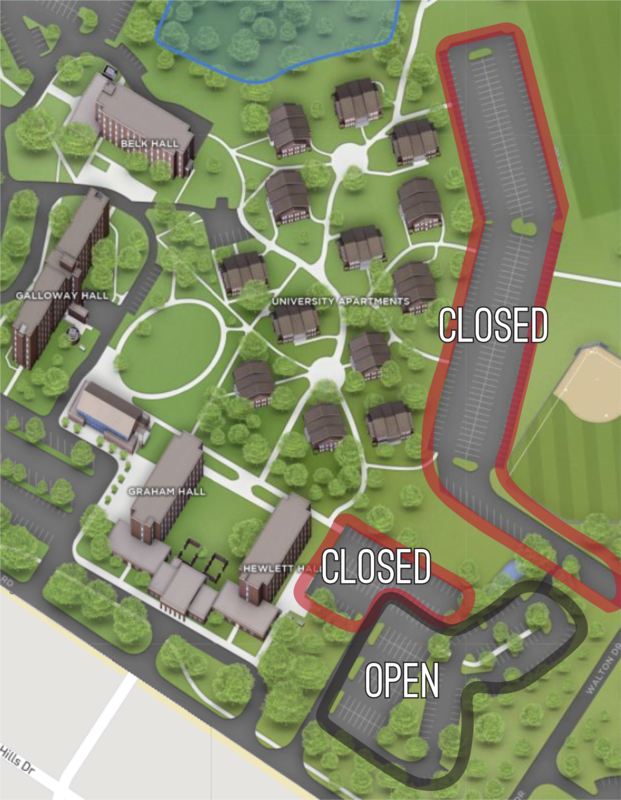 Parking Lot P (University Apartments), and portions of Lot O (Hewlett Hall) are closed for the remainder of the semester due to the development of new housing facilities. In addition, we have expanded the available areas affected permit holders can utilize. Residential students also have the option to park in any other Residential Parking Zone on campus. This includes Zone Blue lots (Suites/Lot EE on Plyler Drive) and Residential Zone Brown lots (Seahawk Crossing, Landing or Village). Resident Blue lot EE normally has plenty of available space for parking. We want to thank our residential permit holders for your continued patience and understanding as we make accommodations for campus construction. Please contact us with any questions. Lot L (outlined in black above) is available to “Residential Zone Black” permit holders as an alternate parking. Lot J (outlined in black above) is available to “Residential Zone Black” permit holders as alternate parking. 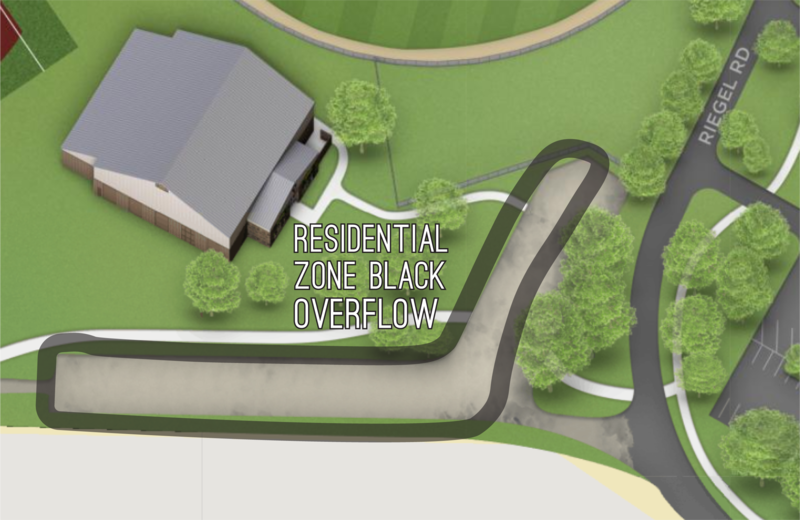 Residential Zone Black overflow parking (outlined in black above) is available to “Residential Zone Black” permit holders as alternate parking. All vehicles parked in Lot P, Lot O and Lot O extension should be moved prior to Sunday, December 16 at 10 a.m., when on campus housing closes for the semester. Parking Lot P (University Apartments), Lot O and Lot O Extension (Hewlett Hall) will be closed due to the construction of the new housing facilities. 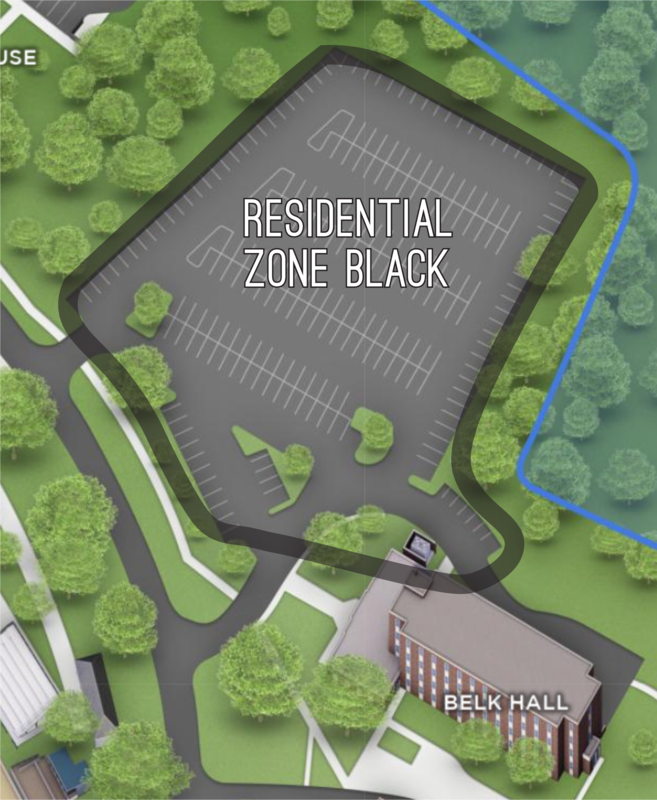 If you plan to leave your vehicle over the winter break, please use other Residential Zone Black parking, Lot L (Belk Hall) and Lot J (Galloway/The Hub). Contact Parking & Transportation Services at 910.962.3178 or parking@uncw.edu with any questions. Lot P (outlined in red top) and Lots O and O extension (outlined in red bottom) will be closed beginning December 16. Lot L (outlined in black above) is available to Residential Zone Black permit holders as an alternate parking. Lot J (outlined in black above) is available to Residential Zone Black permit holders as alternate parking. Due to the recent impacts on Dobo Hall and the need to add modular facilities to campus, the university will have to make temporary changes to parking zones beginning Friday, December 7. Lot D (located in front of Randall Library) will no longer be available for Zone 1 parking during weekdays from 7 a.m.-5 p.m.
Our previous email communication regarding the limited number of available spaces in the parking deck for Zone 1 students received a large response. The deck permits available have all been claimed. Signage has been placed at the parking lots affected and parking attendants will be out to assist with the transition on Friday. We appreciate your continued patience as we all adjust to changes the university is undergoing due to impacts from the hurricane. 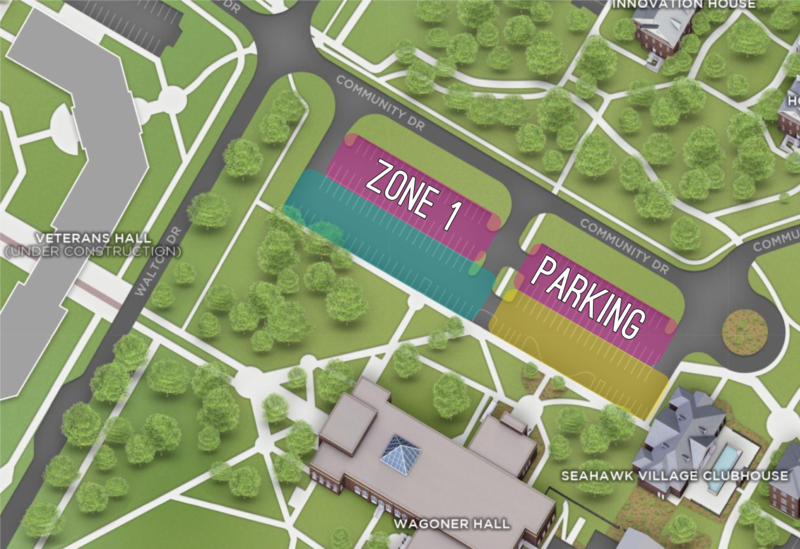 Please remember that Lot C (by Kenan Auditorium), Lot H (across from water tower), Lot I (across from Cultural Arts), Schwartz Lot, and all of Riegel road are available to Zone 1 students. Lot D (outlined in yellow) will be converted to only faculty and staff parking from 7 a.m. - 5 p.m. Monday-Friday. Students with a parking permit may park in lot D in the evenings Monday-Friday from 5 p.m. - 7 a.m. and anytime on weekends. Lot FF shown above will have Zone 1 parking available to students in the area highlighted in magenta. The area highlighted in teal will remain pay station parking and the area highlighted in yellow will remain faculty and staff parking. Due to the recent impacts on Dobo Hall and the need to add modular facilities to campus, the gated Lot G (in front of Morton and Leutze) will be closed for construction at the end of business tomorrow, and will be completely closed on Friday, December 7. Faculty and staff are being directed to park in Lot D (in front of Randall Library). We expect no impacts to existing handicapped parking in the non-gated portion of Lot G and shuttles will operate as normal. Signage has been placed at the parking lots affected and parking attendants will be out to assist with the transition on Friday. Parking will also continue to work with Facilities on exploring possible options to temporarily expand existing areas of faculty and staff parking. Lot G (outlined in red) will be closed to faculty and staff parking due to the construction of the modular facilities. Lot D (outlined in yellow) will be converted to faculty and staff only parking from 7 a.m. - 5 p.m. Monday-Friday. 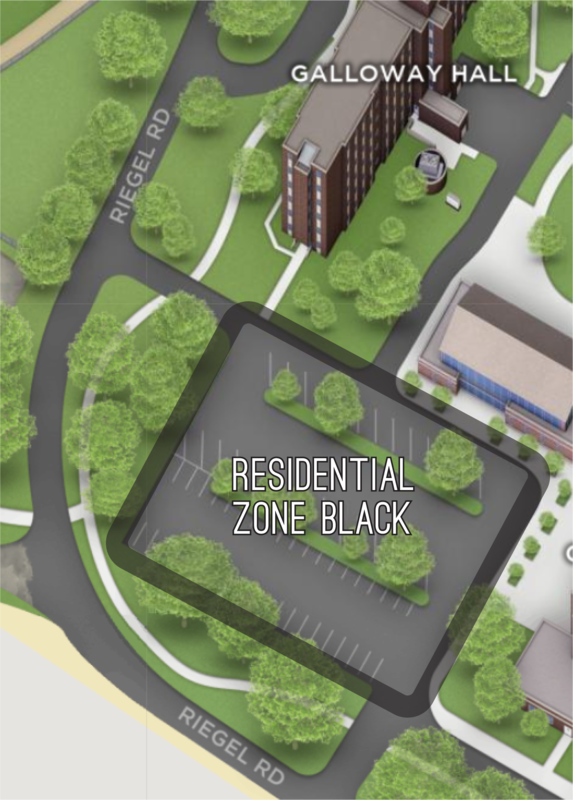 Due to the recent impacts on Dobo Hall and the need to add modular facilities to campus, the university will have to make temporary changes to parking Zones. Lot D (located in front of Randall Library) will no longer be available for Zone 1 parking during weekdays from 7 a.m.-5 p.m. Lot FF (beside Wagoner Hall) will be converted to Zone 1 to make up for the loss of this area. Lot D will remain open for students with a parking permit during the evening on weekdays from 5 p.m.-7 a.m. and anytime on weekends. The Modular Facilities are going to be placed in parking lot G (in front of Morton and Leutze). 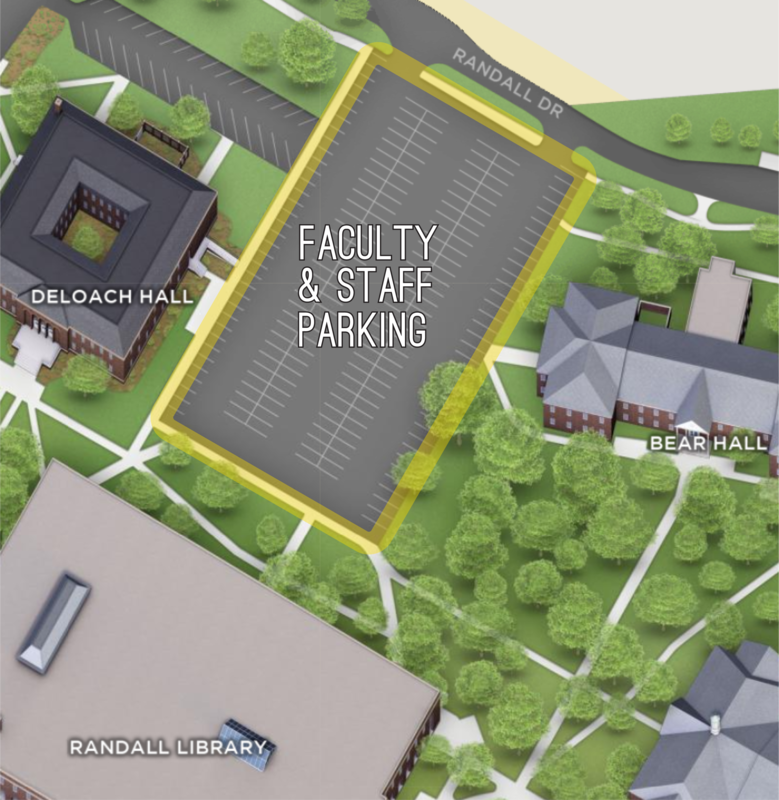 In order to cause the least amount of disruption for the faculty and staff who use the gated parking lot G, lot D (located in front of Randall Library) will be temporarily converted to faculty and staff parking. Parking & Transportation will contact those who may normally park in this gated lot to provide additional parking options and alternate locations. This includes a limited number of spaces in the parking deck, or other faculty and staff lots, such as available space in lot R2 (on Price Dr.). 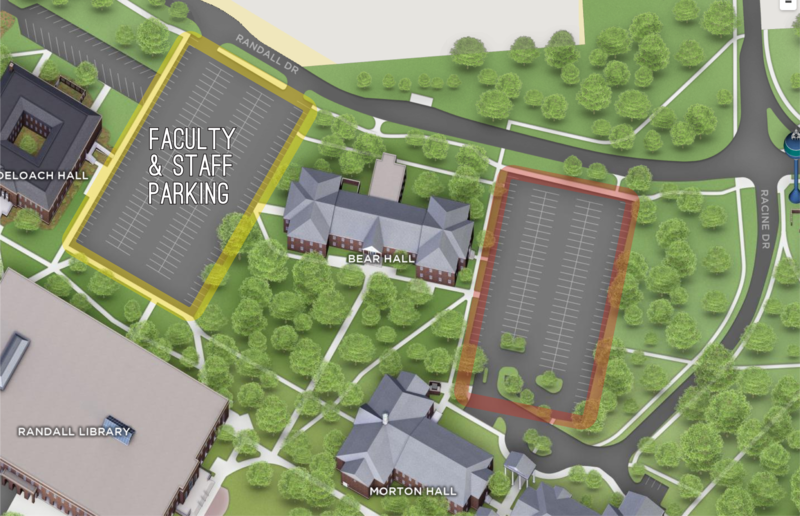 The parking office will also continue to work with Facilities on exploring possible options to temporarily expand existing areas of faculty and staff parking.